More registrations are now open with the contest approaching! Preparations for the Bike Odyssey 2019 have already been started! 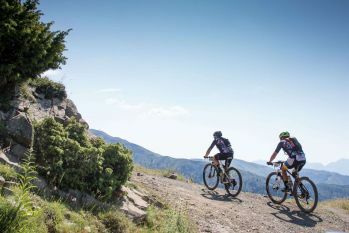 With only two months’ time for the athlete’s registrations to open, the organization team of Bike Odyssey has prepared the form "Find a Teammate" for those who want to take part in the toughest mountain bike race in Greece, but have yet to find someone with the same passion for cycling! With that way, once the person who is interested submits the form and after been in contact, the organization team will get you in touch with your new teammate and thus you will have the chance to experience this unique adventure. On the other hand, if someone has a relative or a friend who take part in the race or just prefers to see the landscapes that Bike Odyssey crosses, then all you need to do is to fill in the form "Odyssey Tourism". This is enough to be able to experience the Bike Odyssey from the side of a tourist, enjoying the beautiful scenery, the picturesque villages and the unparalleled beauty of the nature of mountainous Greece. However, due to the size of a race like Bike Odyssey, in order to have a smooth and successful performance of the race, Bike Odyssey is based on volunteers' contribution. Therefore, if you wish to become a valuable member of the organization team of the Bike Odyssey to help in posts such as the checkpoints, the service etc, all you need to do is fill in the form "Application Volunteer". An essential requirement is the good knowledge of English.